The history of French Bulldogs isn’t 100 percent clear, as there are different people who have different theories about when and where they originated. But many early records indicate that French Bulldogs are the ancestors of the English Bulldogs that were popular in England back in the 1800s. Some English people reportedly used bulldogs for the purpose of “bull baiting” in the early 1800s, which would explain their name. But once it was deemed illegal, it appears as though people stopped doing it and started using bulldogs as pets instead. Over time, reports indicate people loved bulldogs but wished there was a way to make them smaller. So they apparently started crossing English Bulldogs with smaller dogs to create “toy bulldogs” that made the breed even more popular than it already was. From there, bulldogs started to spread out to many other places in the late 1800s. Bulldogs became popular in France first before moving their way into the United States. But by that time, the bulldogs that were being produced no longer resembled the bulldogs from England, which prompted a name change. Rather than calling them English Bulldogs, the Kennel Club renamed them to French Bulldogs in the early 1900s. French Bulldogs are truly a breed all their own, as they look and behave differently than English Bulldogs. They are known for having wrinkled skin, smushed faces, and bat-like ears that set them apart from their predecessors. Over the years, French Bulldogs have transformed into one of the most popular dog breeds in both the United Kingdom and the U.S., and it’s amazing to see how far they have come in a relatively short amount of time. French Bulldogs are highly trainable, good with kids and families, and loyal and affectionate towards their owners, which makes them a great option for anyone looking for a dog. 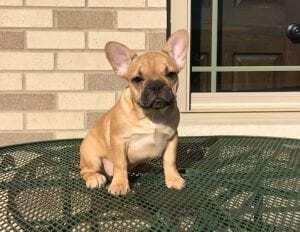 Are you thinking about adding a French Bulldog to your family? Family Puppies would love to help you make it happen. Call us at 574-354-2428 to find out about our latest French Bulldog litters.